eReflect announces that the Ultimate Vocabulary™ editors have compiled a writing-related list of words for every aspiring writer out there who wants a deeper understanding of concepts and principles related to the art of writing. ... it is essential that writers are aware of practices and concepts that describe their reality and their profession. 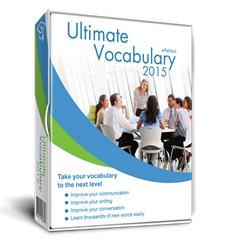 Vocabulary program Ultimate Vocabulary™ recently published a word guide for aspiring authors. The vocabulary software that helps people improve their eloquence and accuracy of communication through vocabulary building, and the editorial team behind the blog are sharing this word list with writers around the world interested in writing-related concepts. Ultimate Vocabulary™ helps students of all ages improve their communication skills through vocabulary building by providing them information about words like “dysgraphia” and “mogigraphia.” These and other interesting and educational words are one way of inspiring new writers and enriching their knowledge of writing-related concepts. According to the Ultimate Vocabulary™ editor, “dysgraphia” refers to the inability of a person to write, despite their willingness to do so. Often the result of a learning disability, dysgraphia-affected individuals cannot write in a legible or coherent manner. “Griffonage” is the word used to describe an illegible piece of writing. Doctors often prescribe medicine in a way that’s impossible to decipher, at least to the untrained eye; many prescriptions can be used as examples of griffonage. eReflect and the Ultimate Vocabulary™ editors share the same goal of helping people increase vocabulary proficiency through fun and effective exercises and games. This word list by Ultimate Vocabulary seeks to enhance this effort with the acknowledgment of phrases and words that writers should be familiar with. As eReflect believes, it is essential that writers are aware of practices and concepts that describe their reality and their profession. An example of this is the word “mogigraphia,” which describes the state of pain a writer is in after a writing spree. Mogigraphia is another term for "scrivener’s palsy," or the cramps, pain, and occasional numbness felt in the wrist and fingers. Ultimate Vocabulary™ also presents the terms “cacoethes scribendi” and “hypergraphia” to its readers. “Hypergraphia” (or “scripturient”) is the burning urge writers experience when they want to write. It also refers to a “mental disorder where the sufferer is compelled to write because of changes in their temporal lobe, something that can be caused by epilepsy or hormonal changes,” the Ultimate Vocabulary editor explains. For the full list of these writing-related terms, visit the Ultimate Vocabulary blog. For more information on how you can benefit from Ultimate Vocabulary, please visit its official website, http://www.ultimatevocabulary.com. Ultimate Vocabulary provides a proven and powerful platform, built to improve anyone’s vocabulary. The interactive self-improvement system provides more learning tools than any other program on the market, as well as more information on words. The Ultimate Vocabulary software provides each and every user with a personal computer tutor. Providing a step-by-step guide to learning a powerful vocabulary, Ultimate Vocabulary is the learning tool everyone can benefit from. Of course, the software is also backed by eReflect’s iron-clad money back guarantee.